The Bear Head Grooming Lime Time Beard Balm has a very nice fresh citrus scent and I love a citrus scent in beard care products. I also love beard balms as my beard looks better, I have a scruffy wirey beard and so a blam gives it some control as well as softening it and in this case giving a lovely fresh scent. It is hand-made from a blend of Shea butter, Cocoa Butter, Beeswax Almond oil, Hemp seed oil, Lime and Benzoin. However unfortunately the balm is very grainy, even more so than the Braveheart balm that I previously tested and it is a shame as this would be an amazing balm if it was creamy smooth. In the video review I was hovering between 85 and 90 out of 100 and I said then go for 90, but whilst writing this I have realised it should be at the lower score of 85 which is still generous as it is so grainy! Grant has now sourced some new Shea Butter for the Bear head balms and this has resol;ved the grainy texture in them. 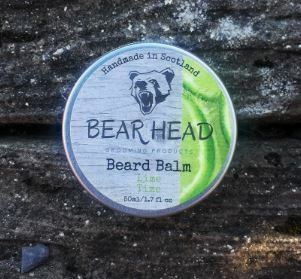 The Bear Head Grooming Lime Time Beard Balm comes in a 50ml screw top tin and costs £12.99 from the website.